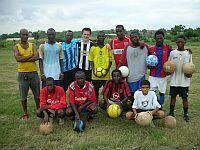 Ben Jacobs is currently taking part in our Soccer Coaching Project in Ghana. Since starting the project he has been coaching at Cantonments FC, a local soccer club and training with Inter Millas a Ghanaian soccer team that plays in the country’s second division. 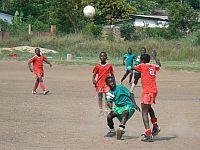 The chance to train with some of Ghana’s soccer stars of the future is a possibility for all volunteers joining the Soccer Project. Many soccer volunteers also get to work with former Stuttgart star, Salim Baroudi who is one of the soccer project supervisors and now manages Inter Millas. Ben tells us: ‘We had been here a couple of weeks when we were asked if we fancied training with Inter. We do our coaching in the late afternoon, so we have some spare time. Because of the heat we play our games at 7.30 in the morning, which is just crazy, but due to the scorching temperatures, people are up and starting their day at four in the morning. Ben has now made three friendly appearances for Inter and is enjoying the chance to play in front of big crowds. With the improvements that he has made to his game since volunteering in Ghana, Ben is keen to see where his enhanced skills could take him in the future.